TEL AVIV, Israel--(BUSINESS WIRE)--Inception, a next-generation immersive content network, today announced a $15M Series A funding round led by RTL Group, a global leader across broadcast, content and digital. This investment helps Inception expand its content catalogue, enhance its technology platform and accelerate growth. 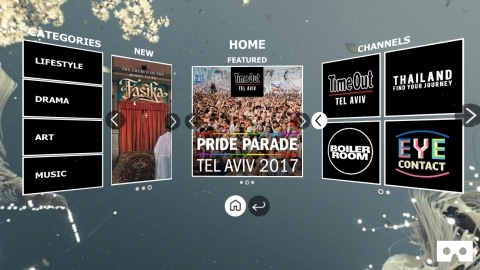 Inception‘s unique combination of proprietary technology and exclusive content formats delivers the most engaging interactive VR experiences via a world-class app. Consumers discover and experience the world’s best VR content on Inception’s app - original programming created with publishers and rights owners, channels of serialised interactive content and curated 3rd party content. Launched in October 2016, Inception has apps for Oculus Rift, Samsung Gear, iOS, Android, Google Daydream and HTC Vive, with Microsoft Windows Mixed Reality & Sony PSVR coming soon. Inception caters to the VR market, which is growing strongly, from 2.1 million head-mounted displays (HMDs) in 2016 to nearly 83 million in 2021, according to Future Source. Add to this the tens of millions of cardboard headsets available, and you have a very active market, fueled by the new devices expected to drop in 2017-2019 from Microsoft, Oculus and Google. Inception was founded in early 2016 by CEO Benny Arbel, CMO Dana Porter Rubinshtein, CCO Effi Wizen, and CTO Nitzan Shenar. Additional participation in the Series A funding came from leading investors including James Packer, Gigi Levy-Weiss, and iAngels. RTL Group is a leader across broadcast, content and digital, with interests in 59 television channels and 31 radio stations, content production throughout the world and rapidly growing digital video businesses. The television portfolio of Europe’s largest broadcaster includes RTL Television in Germany, M6 in France, the RTL channels in the Netherlands, Belgium, Luxembourg, Croatia, Hungary and Antena 3 in Spain. RTL Group’s families of TV channels are either the number one or number two in eight European countries. The Group’s flagship radio station is RTL in France, and it also owns or has interests in other stations in France, Germany, Belgium, the Netherlands, Spain and Luxembourg. RTL Group’s content production arm, FremantleMedia, is one of the largest international creators, producers and distributors of multi-genre content outside the US. With operations in 31 countries, FremantleMedia’s comprehensive global network is responsible for approximately 12,000 hours of programming a year and distributes over 20,000 hours of content worldwide. Combining the catch-up TV services of its broadcasters, the multi-platform networks BroadbandTV, StyleHaul and Divimove as well as FremantleMedia’s more than 260 YouTube channels, RTL Group has become the leading European media company in online video. RTL Group also owns a majority stake in the programmatic video advertising platform SpotX. For more information, please visit RTLGroup.com and follow RTL Group on Twitter @rtlgroup. Inception raises $15M Series A funding led by RTL Group. The leader in creating and distributing VR content becomes RTL Group’s VR partner.